I have normal hair with a very sensitive, easily irritated scalp. 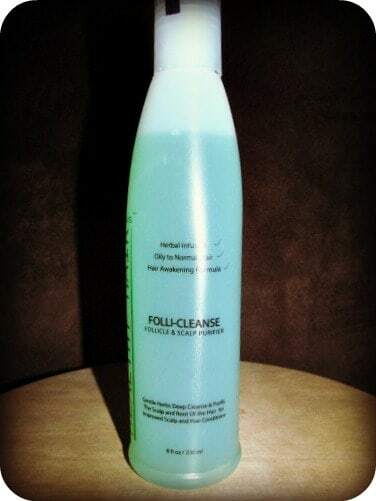 I have tried many different hair care products to help with my scalp issues without noticeable success…….until I used Folli-Cleanse Shampoo! Folli-Cleanse Shampoo by Healthy Hair Plus™ is infused with herbal extracts and Zinc PCA to unclog hair follicles and heavy dirt accumulation at the hair root “stimulating hair circulation” and deeply cleansing the hair. I applied a small amount of shampoo as directed to the scalp and gently lathered especially around the hair follicles. I really liked the light, fresh herbal scent and was pleasantly surprised to see how soft and shiny my hair looked after using this product and my scalp felt refreshed and clean. After approximately two weeks of use, I definitely had less dry, scaly, itchy patches on my scalp and my hair had a bounce to it that I haven’t seen in a long time. This shampoo notes that it is for oily to normal hair but I have dry to normal hair and it worked fine for me with no adverse effects so I think it would work for most hair types. As a bonus to those with oily hair or dandruff this product is designed to halt oil production from the sebaceous glands while stopping DHT accumulation. I like that this does this without drying or stripping hair. Another perk, is that it is also Paraben-free so I have used this shampoo on my children’s hair and scalp too because they have the same problems that I do and it worked great! Even my husband who didn’t want to switch from his conventional dandruff shampoo that he has used for years gave it a try and I notice that since then the shampoo bottle has suspiciously been going down more than just my use and I suspect that I know the culprit! You are invited to visit the Healthy Hair Plus™ website to purchase Folli-Cleanse Shampoo. The SRP for an 8 ounce bottle is $16.95 but it is currently available for purchase for only $11.99! You can also browse the entire collection of high quality, affordable hair care products to find the right product for your hair needs. I’d love to try their Emu Oil for dry scalp. I’d like to try the Argan Oil. I’d like to try the folicleanse shampoo for the elimination of dandruff, flaking, and oily hair. I would like to try because I haven’t found a shampoo that works good with my hair…I am constantly changing so I don’t have dandruff. I’d love to try the Nourish Dry Shampoo. I’d like to try the Argan Oil because I’ve heard great things about it. I would also love to try the No Weight Conditioner. I would like to try the Awaken and Replenish Combo shampoo and conditioner. I would love to try the emu oil! I like that this is Paraben-free and our entire family could use it! I’d like the So Strong Leave In Conditoner. Thanks for the giveaway. I have frizzy hair so they suggested I try the Emu Oil Shampoo.